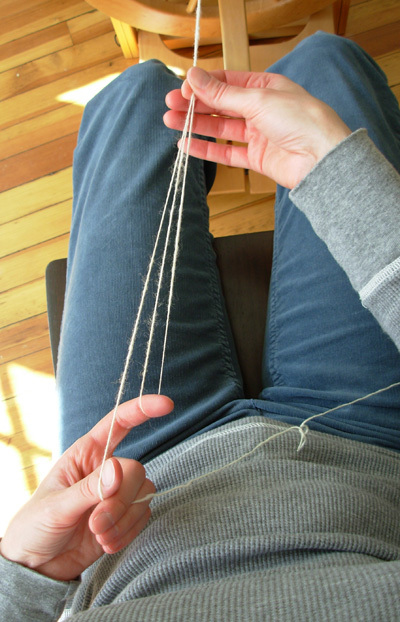 Navajo plying (also called chain plying) is a way to make a three-ply yarn from only a single strand. 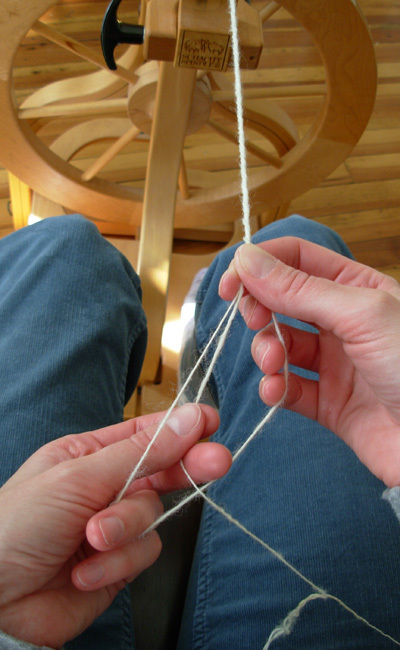 Spinners often use this method when they have spun singles from a multicolored top and want to avoid creating “barber pole” yarn as they ply. Navajo plying preserves the color changes of the original singles, giving you a striped yarn rather than a marled one. If you can crochet a chain, you already know the main step in creating a Navajo plied yarn, but I would recommend mastering a standard two-ply before trying to chain ply. 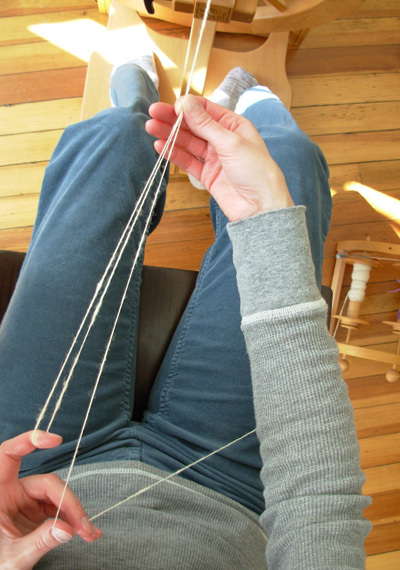 To begin, spin a bobbin full of medium-twist singles and let the twist set at least a day or two. 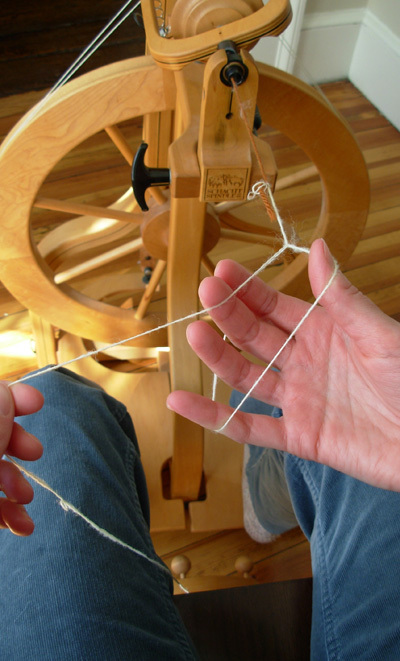 When you are ready to ply, use your slowest whorl to give your hands plenty of time to get used to this new technique. Attach your singles to the leader on your plying bobbin, and make a large slip knot to create the first loop. Alternately, you can create the first loop when you tie your singles to the leader. Remember: if you spun your singles in the Z-direction (clockwise), you’ll need to ply in the S-direction (counterclockwise) or you will end up with a tangled mess. Start your wheel to begin plying. Use your front hand to control the entering twist and your back hand to reach into the loop, grab the singles strand, and create another loop. The loops can be different sizes if you are working with space-dyed yarn. You will notice that little bumps form at these loops as you ply, but they are less noticeable when the yarn is used. Continue to repeat the process, chaining and allowing the twist to enter, while maintaining even tension on all three strands. Don’t worry if you need to stop your wheel to give your hands time to work; you will be able to speed things up once you become used to the motions. Although Navajo plying is not exactly easy, it’s harder to explain than it is to do! One of the advantages of this method that I appreciate the most is the ability to create a three-ply yarn without ending up with slightly different amounts left on three bobbins. Amy King’s Spin Control has a great section on creating chain plied yarns, and a free article by Dodie Rush on “Plying Chained Singles” can be found here. You can also view an excellent Interweave Press video by Sarah Anderson, a 2009 Spin-Off Autumn Retreat mentor, here. Sarah demonstrates how to begin the process and reveals a sneaky pinky move that will help you keep your Navajo plied yarns smooth and even. I tend not to spin from space-dyed fibers on a regular basis, but I still find Navajo plying helpful when I want to work up a quick three-ply sample of a new fiber and don’t want to spin three mini bobbins of yarn—or when I end up spinning a full bobbin of fine cotton singles and run out of steam. Navajo plying gives me a way to salvage a single bobbin of cotton by creating a skein in a usable weight for knitting. Like any other new technique, Navajo plying will feel awkward at first. Keep it slow and keep practicing, and soon you will master it! Lee Juvan learned to spin on a walking wheel when she was twelve in a summer workshop at Old Sturbridge Village in Massachusetts. She bought her own wheel in 1990, and she’s been at it since then. Lee is the designer of several patterns published in Knitty, including Shroom and Brighton. You can see more of her work on Ravelry, where she is “workwoman,” and in Yarn Bombing: The Art of Crochet and Knit Graffiti by Mandy Moore and Leanne Prain.